With summer upon us, pet parents are scrambling to find ways to help out their hot dogs. While providing shaded areas for dogs to relax and making sure to carry a collapsible water dish are all good ideas, pet cooling mats can provide additional comfort no matter where summer adventures take you. Keeping a cooling mat around the house, car, and other areas give your dog a spot where they can always beat the heat and maintain a healthy, comfortable body temperature. There are a lot of cooling dog bed and mat options out there and it is important to get one that is sized for your dog and actually works for you. 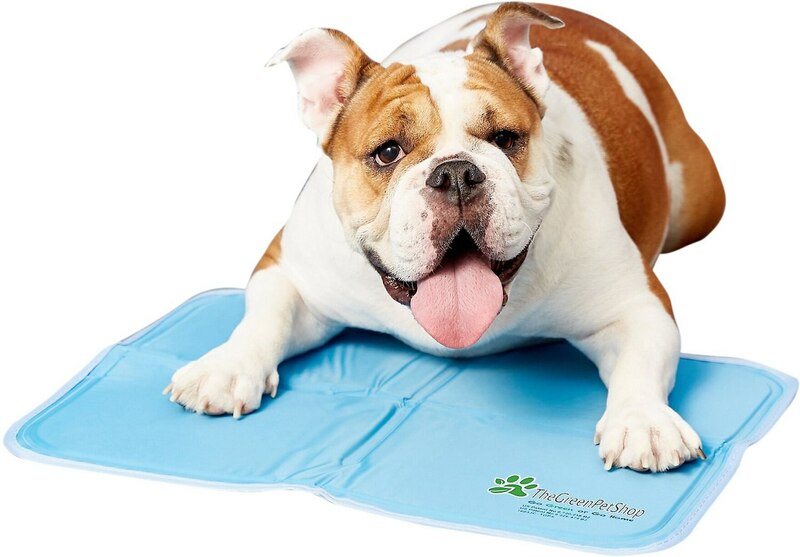 Cooling mats and cool pet pad options come in two types: gel-filled and non-gel filled. Both will be effective to the same degree (no pun intended). Non-gel mats offer a slight advantage in that, if punctured or torn, your pet won’t be exposed to toxic chemicals. For this reason, The Green Pet Shop’s self-cooling mat is our top pick. It’s gel-free, easily cleaned, and doesn’t need to be refrigerated in order to hold its temperature. Like all cooling mats, however, it is susceptible to tearing at some point. This is an inescapable reality due to the nature of cooling pads. The top layer of material needs to be crafted of a specific type of material in order to function as a cooling mat, and that material is easily torn by bigger dogs. Although good old-fashioned duct tape will work in a pinch, we recommend doing what worked for us and buying a roll of Velox rim tape. It’s cotton-backed (which means it’s comfortable underneath your pooch) and originally designed to fix bicycle tube punctures (which means it’s very durable). So Why Does My Dog Need a Cooling Mat? During the hot weather in the summer, pets are prone to heat-related stress and illness. Their body heat is trapped by their fur and heat stroke can occur when your dog’s body temperature rises and is so high that it cannot be regulated by them anymore. 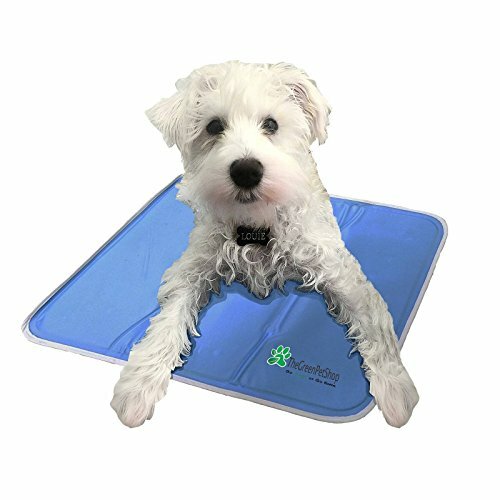 A cooling mat offers your four-legged friend a place to go cool off and bring their body temperature down when needed. Your dog knows a thing or two about what to do so if you just provide them a space they will use it when they need to. A cooling pet pad is a good choice for those that are living in small spaces or without air conditioning. 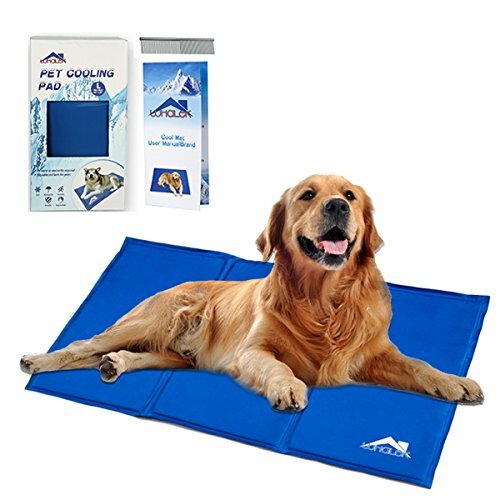 It is especially important to provide a cooling mat for dogs that naturally come from colder climates or have long hair. If you have a polar pooch, you are much better off providing a cooling mat than shaving some double coated breeds (like Huskies). Strangely enough, their coat is part of their process for regulating excess body heat, and you can do more harm than good by shearing off too much fuzz. There are essentially two types of cooling mats for dogs: those that use gel and those that do not. The decision on which one to buy is entirely a matter of personal preference. Both will cool your pet on hot summer days, but gel mats will generally “hold” their temperature for longer than non-gel mats. This means that a non-gel cooling mat will need to be “recharged” slightly more often than a gel-filled mat, which you can do by simply sticking it in the freezer as you would with ice packs. Although non-gel mats can require a little more work, they’re also free of any toxic chemicals. Although the gel within gel-infused dog cooling pads does not come in contact directly with your four-legged friend during the course of normal use, the cool mat can be easily punctured or torn. If your dog is destructive, has long nails, or is simply rough on their beds, think carefully before purchasing a gel mat. Punctures are easy (and cheap) to repair, but the gel can be toxic if swallowed. The Whalek cooling mat is ideal for travel or home. It folds up easily for storage when not in use and it is large enough for bigger dogs or a cat or two to get some relief. There are two sizes available 35.4 x 19.7 in and 37.8 x 31.9 inch. The one in the link above is the smaller size. The larger size is great for the really big long haired breeds. The mat is activated by pressure when your pet steps on it. The blue color is a favorite of pet parents everywhere. 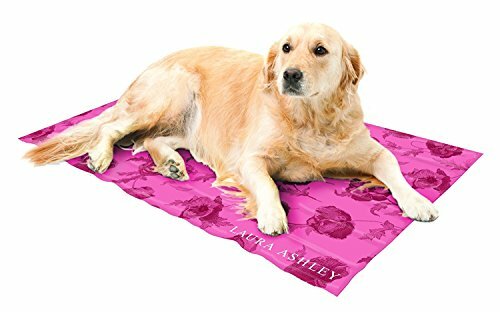 For those that want dog cooling mats that makes a fashion statement no matter where you are, there is the Laura Ashley Therapeutic Cooling Pad. The large 20 x 36-inch size is comfortable for pets of many sizes. Assorted fashion colors and prints go well beyond the basic blue or green pads you may be used to seeing. Gel technology keeps your dog cool and comfortable. 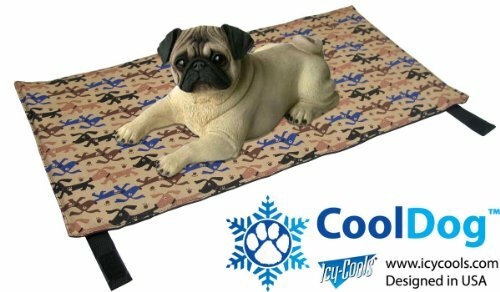 Those with smaller dogs could use this pad to cool a few pooches at once. This mat is super easy to clean with a damp cloth. The Green Pet Shop is a time tested company with a lot of happy dog parents that swear by their products. These cooling mats are available in sizes that range from 15.7 x 11.8 inches to a huge 45 x 27.5 inches for those giant love hounds out there. 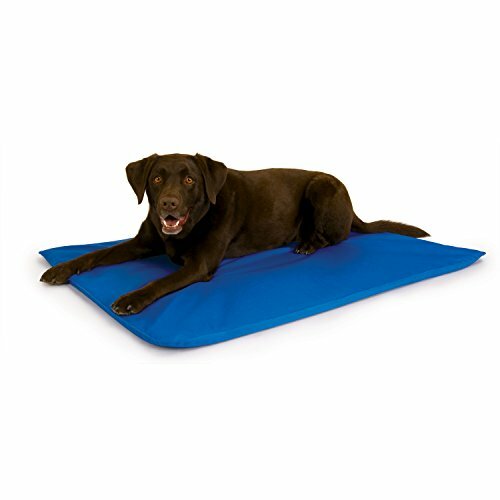 The cushy gel mat starts working immediately when your pet gets on it. Even the largest size can be folded and stored in a small space. 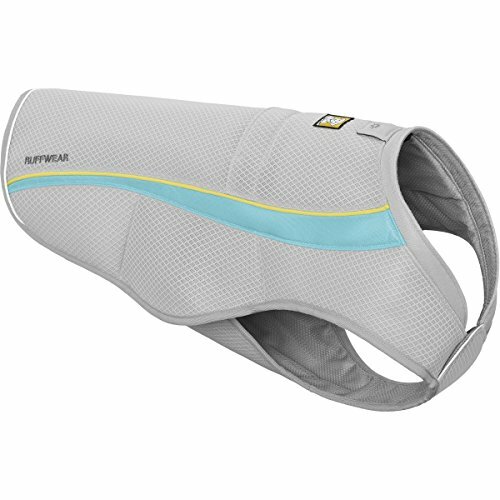 The extra cushioning provides support to dogs joints and hips. Imagine an adjustable cooling and cushioning waterbed for your pooch! For pet owners that don’t mind doing a little bit of work to keep their pooch cool, the Cool Bed III dog cooling bed is something to consider. While many traditional cooling mats are only about 1/4 in thick, this mat can be adjusted with water to provide extra cushioning and cooling comfort. On really hot days fill it with iced water and watch the reaction from your dog! 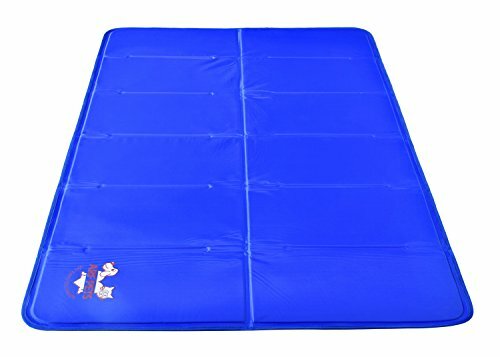 This mat comes in different sizes so you don’t have to be filling up a huge one for a small dog. The maker claims that if your home’s room temperature is 80 degrees Fahrenheit on the inside then the cooling bed will be an outstanding 22 degrees cooler than your dog. That is a lot of cooling power for hot weather. They say you only need to fill once per year with water. 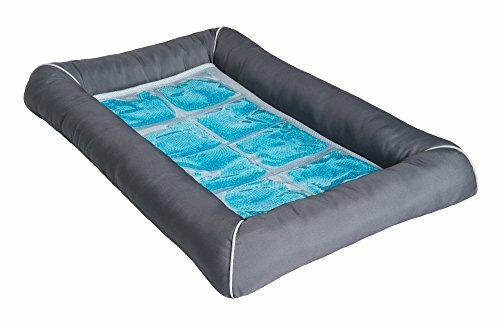 Of course, this is a water bed and the large holds 4-6 gallons of water so if you have any pets with destructive tendencies then be aware! This is built thick and to take a lot of abuse but a determined dog or cat could possibly cause a leak. Animal Planet makes these inexpensive cooling mats for moderate relief of the heat. If you are on a budget this is a good choice for indoor use. Outside it might not hold up so well over time. The durable gel construction absorbs body heat and allows your dog to have soft comfort in the home. You have to love the fun colors you can choose from as well. Lime green and light blue make the mat easy to see and they help cool your pet because light colors do not absorb heat as readily as darker colors. 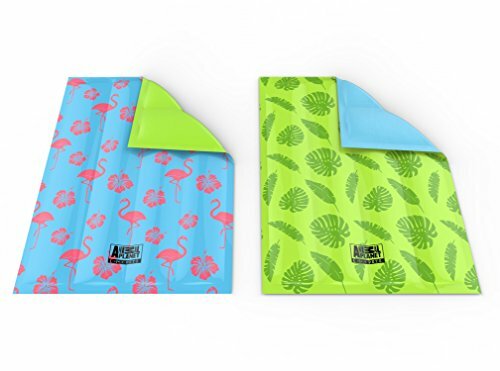 This super cute small cooling pad looks like a classy beach towel or yoga mat. It is affordable and rolls up for easy storage. For those that have a small dog, this is a great choice. Just wipe down for easy clean-up. This is a good one for a first cooling pad for a puppy. It is easy to picture your dog under an umbrella on the beach with this cool pad, so add it to your shopping cart now. Some dogs really prefer a nest style dog bed. This cooling dog bed has sides and a gel design that soothes, comforts, and offers outstanding protection from the heat of the summer. You can get this bed in two sizes but when in doubt get the larger. The biggest complaint about this is that it is smaller than customers expected. While this pad will cool without any inputs, you can remove the gel insert and stick it in the freezer and put it back in for fast cooling relief. This fun designed cooling mat features a fun design and has an insert that can be removed and frozen. This mat is 12×24 inches so this is best for dogs that are small to medium sized. If you need a larger cooling mat you can always buy 2 or more and link them together using the handy velcro that is included. This company is smart for making a mat that is inexpensive and that can be combined for large or multiple pet households. 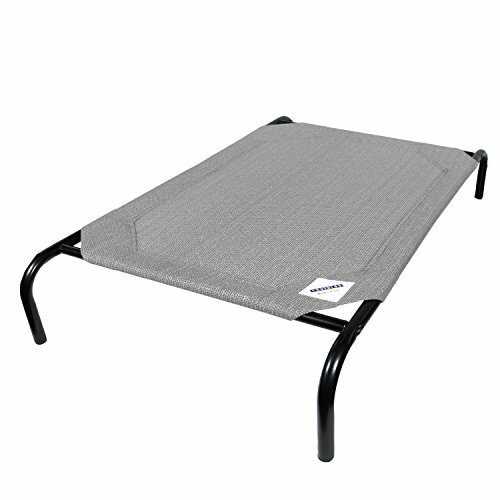 This mat is designed to be non-slip and is made in the USA of quality materials. that will help your dog cool off during those hot times. Of course, you get the added benefit of watering your lawn at the same time. This isn’t always an option if you are going through a heat wave and have water rationing in effect. Even if you decide to buy a cooling mat, a kiddie pool is still a great tool to have in your arsenal on hot summer days. Who hasn’t seen those cute kiddy pools at the local department store, available for in-store pickup? These plastic pools are really cheap to buy and you can just fill them up with a standard garden hose. If you have kids they will have a lot of fun with this one and you will have some really cute pictures to show off. Large long haired breeds have a tendency to love these things once they realize what they have to offer. A livestock tank is more expensive but durable if you have the room. Hot cars are dangerous things indeed. Never leave a dog unattended in a vehicle with the windows rolled up for any reason for any length of time. That said, even cars that are completely powered on with fully functioning air-conditioning can get hot in the back seat, risking heat stroke or worse for your pal. Pet owners can power a fan in your car to help your dog keep cool and circulate the cold air from the front vents into the backseat. Air conditioning is great and all when it works. Even if you are going down the road with the windows open, some vehicles don’t have back windows that open very far and your dog may still be quite hot. A lot of dogs are happy once they discover a fan they can get under or in front of when at home. A box fan is $20 and can do a lot to help out your pooch during the hottest times of the year. Air flow from underneath can help your dog stay cool and comfortable. These beds are inexpensive and made in plenty of sizes so your pet can rest outside or in with cool comfort. For extra cooling capability, put a pet cooling mat on the surface. This can help if your dog is used to more cushioning and support. This elevated pet bed comes in 4 fun colors to suit your mood and decor. Choose from green, gray, terracotta, or nutmeg. The bed puts your pet 7 inches above ground so it is not so high that it is hard for them to get in and out of in most cases. 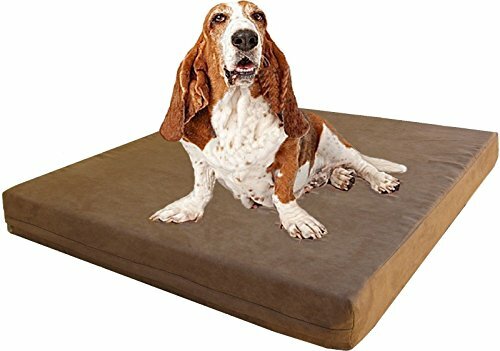 Of course, this type of bed is going to only work well on surfaces that are level so it is not quite as versatile as a cool pet pad for some dog parents. Your pooch will look and feel awesome when using this by the pool during the heat of the day! Can we just say wow? Your polar pooch will love this pet bed. It is an amazing 4 inches thick and has a cooling gel layer to keep your dog well supported, comfortable, and the right temperature on hot days! This bed is available in 7 sizes so there is sure to be one to accommodate your dog, cat, or both! The bed comes with a water proof liner to protect the foam from ever being damaged even if your pet has an accident. The outer cover is machine washable and they even give you an extra cover so you can have one in the wash and one being used. This is a good all round choice if you don’t want a bunch of extra pet beds to maintain at once. If you have pets that like to sleep cuddled together than you might want to consider just purchasing a larger size of this bed so they can all get on it together. A lot of dogs like to spend as much time with their people as they can. Service dogs in particular might actually need to be working throughout some pretty hot temperatures. A cooling vest not only looks good, they help cool your dog’s core making it possible for you to take walks and go out and about without them being totally miserable. The Ruffwear dog cooling vest features three different layers and has a reflective nature that helps keep you and your dog safe during outdoor activities. The reflective, wicking outer layer facilitates evaporation, an absorbent middle layer stores water for evaporation, and a comfortable inner layer releases this cooling action to your dog. Scout loves that this vest is made to last and can be purchased in a huge range of sizes for a comfortable and precise fit. The vest acts as a swamp cooler because it only uses the power of evaporation so you don’t have to freeze or do anything. Your dog will also have an excellent range of motion using this vest so they can enjoy themselves without feeling restricted in movement. Chill out your dog with this cute ice bandana. Simply freeze and apply for lasting cooling. This is a good one for the dog park or when on vacations. Make sure you get the right size for your dog as it is not as adjustable as some products. 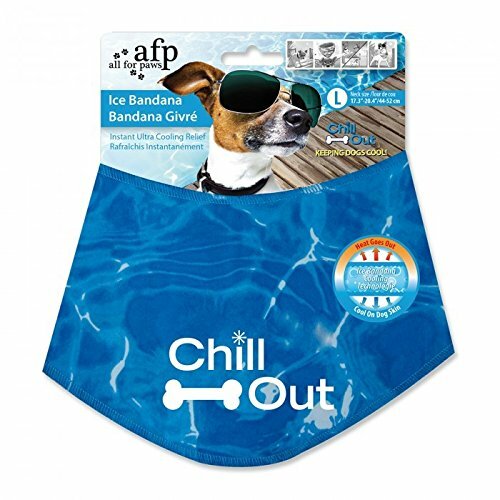 If your dog likes to be very active during the summer than an ice bandana might be just what they need for downtime. As you can see, there are a lot of fabulous ways to help your pet stay comfortable and healthy during hot temperatures. A lot of pet parents will want to use several methods depending on if they are home, traveling, or just enjoying the great outdoors with their dog. No matter what type of dog you have, they will appreciate being kept more comfortable and they may be able to do more with you outside. Just remember it may take some time to get your dog used to the idea of the new dog cooling mats, beds, or even just having a few different places to lounge than just the single place they had before! Once your dog realizes that they are more comfortable, it won’t be hard to get them to continue using what you have provided your beloved pooch!